I was waiting for the bus with my daughter and I was starving. I missed breakfast and had a quick snack a couple hours earlier but I was getting the shakes from low sugar in my system. I don't get it often but when it get it I have to eat something fast before I crash. I had some puffies in my bag and I start to dig in. I tried both the beets and strawberries and cheesy broccoli. Both tastes really good. I could only taste a hint of strawberry flavour in the beets and strawberries and the cheesy broccoli tastes like cheese crackers. 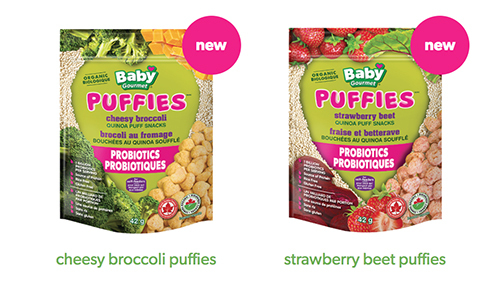 Puffies melts in your mouth so it is great for little kids without all their baby teeth. My one year old niece would love these. They are bit sized in cute little heart shapes. I doubt you want to put candies and chocolate as stocking stuffers for the little ones who are too young to eat junk. You can put in Puffies as well as Slammers in their stockings. I would like to offer one of my readers to win a Puffies prize pack. This giveaway will run from December 18th, 2017 to January 15th, 2018 (midnight EST). Winner, You have 24 hours to reply. You must be 18+ Open to Canadians Good Luck! I live in NB and would go with the strawberry beet. i am in BC and would like to try the strawberry beet first. I'm in Ontario and I'd like to try the Strawberry beet. Happy Holidays,I am in Newfoundland and would like to try the strawberry beet first. Am in BC. Kiddo would love Strawberry Beet for the first one. I'm from Ontario and think she would like the strawberry and beets best. im from ontario and would like to try the strawberry beet first. From BC. Would be nice to try the strawberry beet first. I am from Ontario and I would choose Cheesy Broccoli to try first. I am in Ontario. We would like to try the strawberry beet puffies. Strawberry beet puffies i think my son would love most, im in ontario . I'm in BC and Would love to try the Strawberry Beet Puffies! I am in Alberta. I would try the Strawberry Beet Puffies the first. I'm in BC and I think my son would love to try the strawberry beet first. I'm from BC and my daughter would like the strawberry beet. I live in Ontario. My kiddos would love to try the Strawberry Beet flavour first. I'm in Ontario. I think my child would like to try the Strawberry beet.